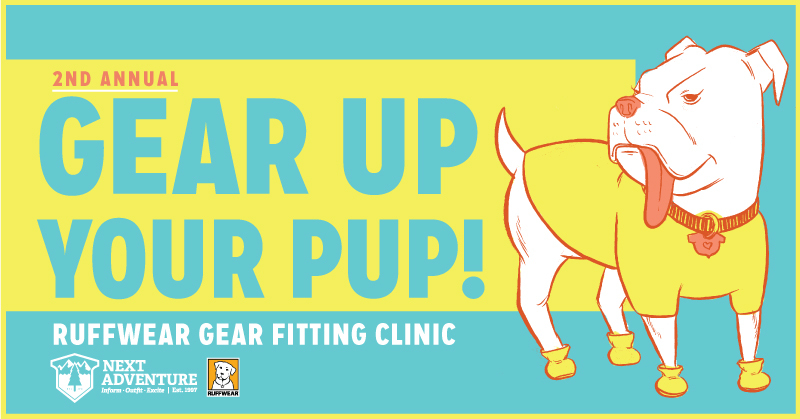 Join us on Sunday March 10th for our 2nd Annual Gear up your Pup event benefiting Portland’s own The Pongo Fund! We’re teaming with Ruffwear to offer a day of all things DOG! Matt, the Ruffwear West Coast Territory Manager will be here along with Phido Photography (recently voted Portland’s Best Pet Photographer by Spot magazine readers!!) Matt will be available to assist with custom Ruffwear dog gear fittings and answer questions. Phido Photography will also be here and is offering pet portraits including prints for purchase (starting at $45 for a 5x7 print & social media file) with proceeds benefiting the Pongo Fund from 12-3. Also, all dog gear will be 10% off for the day! When you donate $20 (which Next Adventure will match, up to $500 total!!!) to the Pongo Fund you will receive a complimentary “doggie bag” to take home ($55 value!!). The bag includes: a microfiber quick dry pack towel (perfect for those muddy dog park jaunts), reflective leash, dog treats, Ruffwear travel bowl and toy, human treats from our friends at Hopworks, and a coupon for your next dog gear purchase at Next Adventure. We are proud to support The Pongo Fund which is Oregon’s only full-time charity fighting animal hunger. Because hungry people have hungry pets. We work tirelessly to reduce shelter populations and keep families together by providing emergency pet food assistance to those struggling to keep their own pets fed, protecting beloved family pets from the suffering, starvation, surrender, abandonment or worse, when a lack of food, but not a lack of love, is their only enemy. Last year after this event we were able to donate $1100 to Best Friends Animal Society thanks to the attendees and we’re looking to beat that number this year! We look forward to seeing you AND your pup on the 10th!